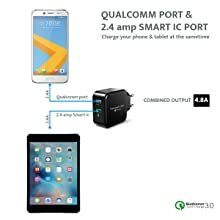 Qualcomm Quick Charge 3.0 + Smart IC Technology together : One port supported with Qualcomm quick charge 3.0 designed to charge twice as fast as Quick Charge 1.0 and to be 38 percent more efficient than Quick Charge 2.0.Another port supported with Smart IC delivers the maximum electrical current to devices that have a 5V input voltage. 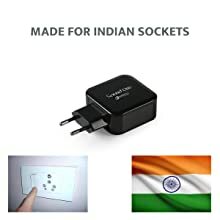 Indian Connectors: Made for Indian sockets. 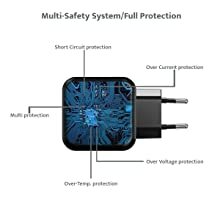 Full Protection: Multi-Protection, Trusted Quality:Fireproof Materials,Over-Voltage Protection,Over-Current Protection,Over-Temp Protection,Short-Circuit Protection. One port with Qualcomm Quick charge & another port with Smart IC provides you to charge your devices efficiently to reach full charge at lesser time according to your device. 30W/4.8A Dual USB output lets you charge any two smartphones or tablet devices simultaneously at the fastest speed (each 2.4A max). Charger equipped with Over-Charge, Over-Voltage Protection. 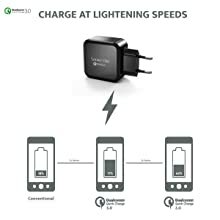 Decreases the extra heat of the compatible phone up to 45%; 38% more efficient compare to the previous generation Quick Charge 2.0. Charger can get a little heated up at times, which is normal, due to higher current output and faster charging.